The front face of the 1920's Keene Barn at night. This barn at the junction of Routes 9 and 73 in Keene, NY is possibly one of the most photographed sites in the Adirondacks. Certainly the most photographed barn. This is evident by the number of cars and photographers that line up during sunrise and sunset (and other times), even during a workday. Though I visited a couple of times during the day (none during real ideal light), I decided to make a special trip at night and photograph the barn in the moonlight with the stars. Hopefully, I created some more unique interpretations that are a bit different than the images usually made here. I'm going to briefly detail my process for creating these two images. This first image here was actually one of the last images of the night. Once night fell, I worked the subject starting with a pretty wide view and moving closer and closer in for each composition. As the night went on, clouds developed and were lit by the light of an amazingly bright gibbous moon. I had brought my complement of light painting flashlights with me, but I found myself using them very seldom. Instead the combination of the moon, a nearby streetlight at the highway junction, and the occasional headlights of a passing car, provided an excellent warm illumination that balanced pretty well in intensity (over the 30 second exposures) with the moonlight clouds and starlight. The exposure was at ISO 1000, f/5.6, and 30 seconds. I stopped down from the widest aperture on my f/2.8 lens, because even though I wanted to capture plenty of bright stars, I also wanted to be sure that my foreground was relatively sharp while still maintaining sharpness in the stars at infinity focus. In retrospect, I wish I had sped my shutter speed up to 20-25 seconds or so, because I got a little more motion in the stars than I wanted to. I wanted points, not ovals or dashes. In my excitement, I didn't zoom in on the stars enough when reviewing in the field to make sure that they were being frozen. I used the 11mm zoom setting on my Toshiba 11-16mm. I wanted to crop in on the barn so it was just barn and sky without space on the sides and get the perspective of point the camera upwards. I also couldn't move too much farther back, because there was a dip in the ground that would change the perspective and taller grass that would block the view of the lens. 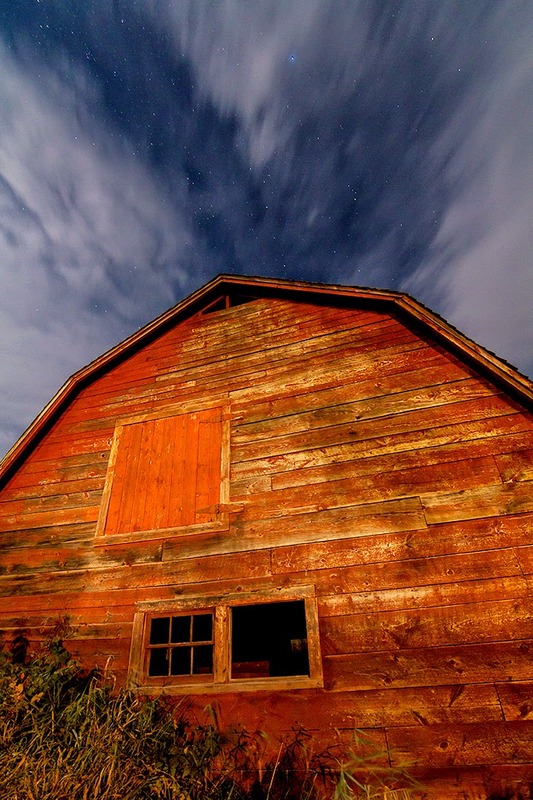 I did love the motion in the moonlight lit clouds and how their absence formed a "V" shape at the apex of the barn. In the second image, I wanted to highlight the texture of the deteriorating roof, so I did end up using a LED flashlight to add some light to the roof of the barn. I actually ended up manually blending (in Photoshop) that roof exposure with another barn exposure where the headlights of a car happened to hit the barn and the background trees providing more light for a warmer exposure with less noise. The exposure was the same as the image above, but I was a lot farther out from the barn and zoomed into 14mm. I wanted to frame the barn tightly, so the detail in the roof was visible, but leave just enough breathing room on the sides of the barn so the composition didn't feel cramped. I hope you enjoyed the images and hearing about the process that went into making them. Please be sure to check out my other Adirondack Adventures posts while you are here. 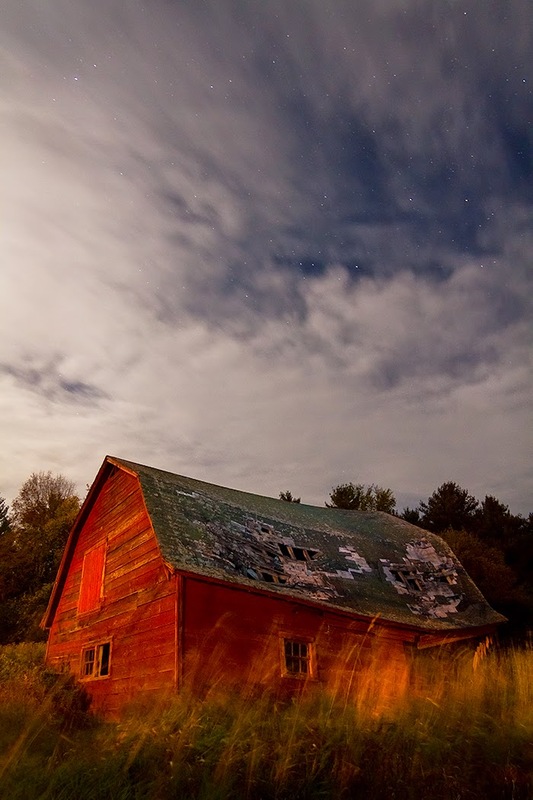 The deteriorating Keene Barn in the Adirondacks under the stars and moonlight.